I have a lovely quick giveaway for one of my readers! ... This one is only open to the Bromley and Beckenham area. The lovely Joanna from http://www.yummycakecompany.co.uk/ has accidentally made too many of her delicious carrot cake cupcakes and would like to share them with one of my readers. 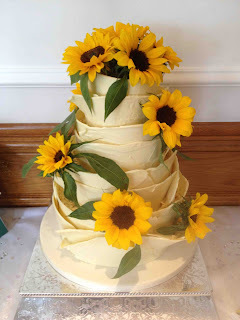 The yummy cake company based in Bromley, who make amazing wedding (the one in the picture is amazing isn't it! ), birthday and event cakes, will be delivering them to the winner tomorrow (Friday) so it really is a quick comp! To enter, please take a look at the yummy cake company http://www.yummycakecompany.co.uk/ website and name your favourite cake flavour in the comments box bellow! Please remember to include a way to contact you such as email or twitter ID. The competition closes at 6pm today (22.08.13) and there will be one winner chosen using random.org. The winner will need to respond with their Beckenham/ Bromley delivery address by 9pm today so that delivery can be arranged for tomorrow (Friday). Carrot is definitely the best cake flavour (not just saying that because that's what's up for grabs!). I'm having a small dinner party tomorrow night and these could go down a treat, you know what they say, a party without cake is just a meeting! ps. the detail in that wedding cake is amazing, I wish I knew about this company when we got married!! carrot definitely - it's my mum's fave cake flavour luckily and I'd love to treat her because she has been extra awesome this year! Lemon Sponge for sure...with a nice cup of tea! And another entry! From My mum in law Jiff, who has also had difficulty commenting today - is there a problem with blogger today?